Last night I watched Saving Mr. Banks. It is a touching film about Walt Disney’s persistence to purchase the rights to P.L. Travers’ book so he could produce the movie Mary Poppins. It’s been so long since I’ve seen Mary Poppins that I don’t recall the whole plot, but from what I remember Ms. Poppins was quite the relief from what the children were used to. In the movie Saving Mr. Banks you get a new perspective of what the story of Mary Poppins is really about. The true story really isn’t close to what Disney brought to the big screen. Disney brought the ending that every child dreams to have, an ending of love and reconciliation. The reality is that many of us don’t reconcile with our parents the hurts of our childhood. We don’t have a magical nanny to come rescue us and bring unity back into our broken, dysfunctional families. As I watched Saving Mr. Banks I thought to myself, ‘Why don’t I have a tremendously dysfunctional family? We’ve all done and said things to hurt one another and yet we still spend time together, call each other often, etc. Why didn’t I need a Mary Poppins when my childhood had its rough times as well?’ We all need a Mary Poppins sometime in our lives. The answer is that my Mary Poppins was more magical and mysterious, more fun and exciting, more supercalifragilisticexpialidocious than Ms. Poppins could ever be because my rescuer, my protector, my encourager was Jesus Christ. Fortunately my mom talked to me about God when I was a kid, even before we started going to church or calling ourselves Christians. Later on we went to church where I learned a lot about Jesus and all his power and might. I learned from a very young age that God was the place to run when I was scared, whether I was scared of the dark or scared of how things were going. He was always faithful. So while it’s cute and fun to believe in this magical singing nanny, Ms. Poppins is a far cry from our true Savior. I don’t want to ignore, however, that God uses people like nannies or friends or strangers or pastors to speak truth and life into us, but I just want to point out that without Jesus our human strength falls short of the redemption and deliverance we all yearn for. I know you yearn for it too because you were born to yearn for Him. 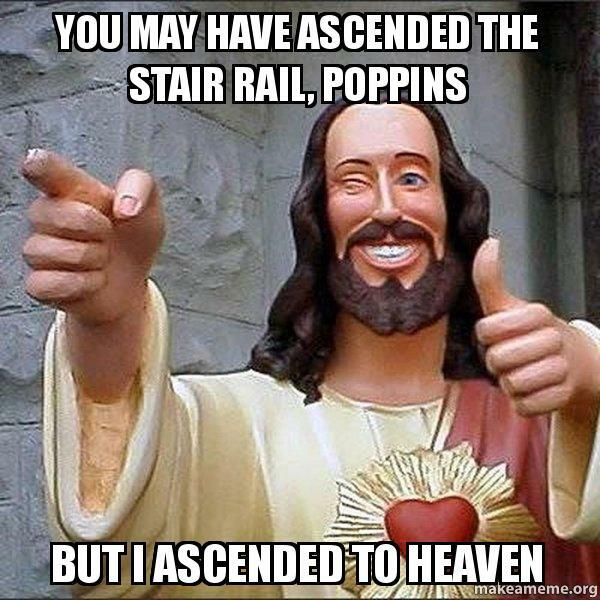 So while Mary Poppins saves Mr. Banks, Jesus saves all who believe. This entry was posted in Reflections & Revelations and tagged deliverance, Disney, encourager, God, inspiration, Jesus, Mary Poppins, meme, protector, redemption, reflection, rescuer, revelation, saving, Saving Mr. Banks, savior, spirituality, truth, Walt Disney on January 13, 2014 by sitathisfeet.